Exclude - Excluding a category is used to avoid using categories which are not relevant to AdWords advertising. Variation - Using a variation allows you add additional terms which will be used alongside the original value. Replace - Replace is a combination of Exclude and Variation. The original value excluded and a new one used in its place. Replace can be used in combination with variation. The language used to identify your brands, categories and filters on your website may not be the optimised to suit the way in which customers search for your products in Google. Category rewrites allows you to replace your category, brand and filter names as well as apply variations on them so that you can ensure the language used in your keyword and ads are optimised to suit customers search behaviour. Category Rewrites for Search Ads can be found on the Categories step of your inventory configuration. You can find your inventory configuration by clicking the cog wheel on your inventory detail card from the website overview screen. On the categories step of your configuration, use the spreadsheet to apply replacements and variations to each of your categories, brands and various product filters. 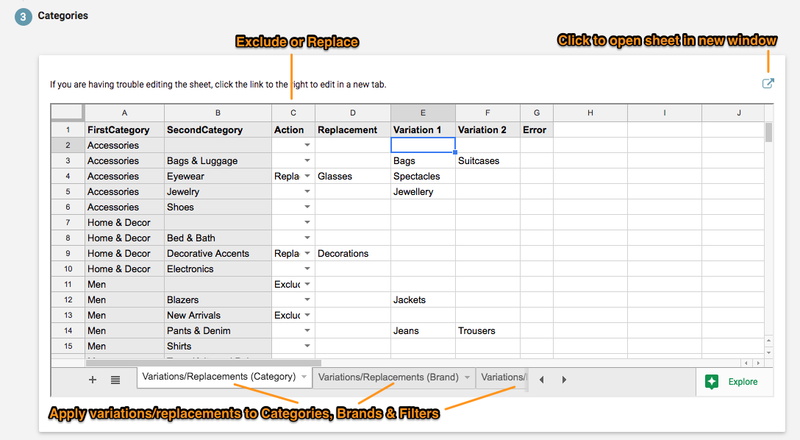 Use the tabs at the bottom of the sheet to switch between your category, brand and filter configurations. Note: If you do not select an action from the dropdown, then the original category name will be used in your keywords and ads along with any variations which you have entered. Note: Click the new window icon in the top right corner of the category configuration pane (highlighted in the screenshot below) to open your category sheet in a new window where you can more easily edit your replacements and variations. A shoe website has products categorised as new season products. This name is good for the website, as customers are already on the website, have demonstrated an interest in shoes and have the context to know that this category refers to new season shoes. As a result, the category new season should be excluded. To apply a variation to an element, enter variation values the variations in the variation 1 and variation 2 columns in the row for which the variations are to be applied. The action column should be left blank if you only wish to add variations. An electronics website has a category of product called computer monitors. However, people may also search for PC monitors, which refers to the same group of products. By adding a variation of PC monitors, any time an ad group, keyword or ads for computer monitors is created an ad group, keyword or ad for PC monitors will also be created. An apparel website has a category called skirts. In the context of the website, this makes sense, as it comes under the category of Women's. However, for the AdWords campaign, this category should be replaced with Women's Skirts. Additionally, a variation of Ladies' Skirts can be added to reach people searching using different language. Duplicate Value Detected: This occurs when you have the same variation or replacement present more than once. Resolve it by only having each term present once in the variations and replacements.